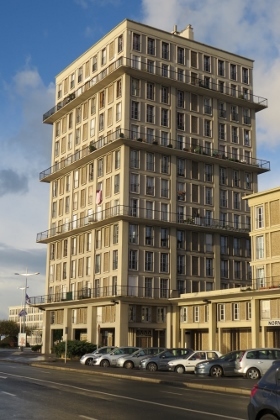 Le Havre, the city rebuilt by Auguste Perret, is an outstanding post-war example of urban planning and architecture. 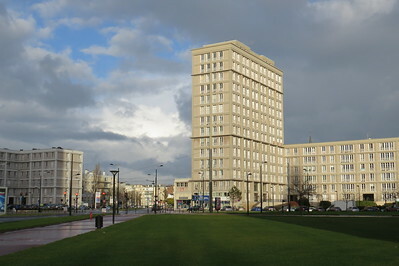 As a result of numerous air-raids during World War Two, the port of Le Havre lost its administrative and cultural center as well as much of its housing in the center of the city. 5000 people died and more than 80,000 people were left homeless. Reconstruction planning began in 1945 with Auguste Perret as chief architect and city planner. It lasted until 1964. Historical patterns like streets and squares were preserved, as well as the 16th-century cathedral and 19th-century law courts that survived the bombings. Modernist buildings based on reinforced concrete were added. I visited Le Havre as a break on my 6.5 hour drive from Bayeux back home. My expectations for the city weren't high so I allowed only an hour or two, but it wasn't bad at all. I could drive up all the way to the Hotel de Ville, and parked in the street 50m from there. These streets were the first pleasant surprise: very wide, aligned with trees, with a tramway in the middle, and lots of parking spaces on either side. The pavement has separate tracks for pedestrians and cyclists. They were used by locals out for some Sunday morning excercise. To see the city center I walked the main boulevards which are aligned as a triangle: Rue de Paris, Boulevard Francois 1er and Avenue Foch. The Rue de Paris starts in front of the Hotel de Ville, which is one of the main sights of the city. The street itself is a shopping street, but has the charachteristic beige low rise buildings that I would see throughout. On the right you will pass the white cultural center that Niemeyer gave the city, on the left side lies the city's cathedral, one of the few surviving old buildings. The street ends at the seafront, where two tall towers designed by Lambert symbolize a gateway into the city. The area was / is used as a social housing project. I liked the architecture of it. From there, the Boulevard Francois 1er starts and you walk towards the city's beacon: the church of St. Joseph. Its high tower can be seen from anywhere in the city center, and reputedly was built as a "spiritual lighthouse". Its interior is not what you would expect of a regular church, it's more like a meeting room with pink/purple stained glass windows (a bit similar to the Sanctuario Dom Bosco in Brasilia). When walking around Le Havre, that other modernist city Brasilia frequently springs to mind. I visited Brazil's capital in 2004, and must say that was a totally different experience. Its city plan and buildings are much more extreme, their design made for effect. It did not seem a liveable city at all. Although some of the reviewers below comment on the dreariness of Le Havre, I found Le Havre much softer in its approach and more gentle to its inhabitants. I visited Le Havre as a day trip from Paris on a hot summer day during the EURO 2016, as a distraction after watching a poor performance by the Austrian team. It is a very pleasant city with many parks and a beach, and the WH part can be explored in a short walk. During WW II, Le Havre was an important port for the Germans, and thus regularly bombed by the Allies. After the war, it was rebuilt according to a master plan by Auguste Perret, also known as the mentor and teacher of Le Corbusier. The only buildings designed by Perret himself are the town hall (impressive from the outside, but I did not enter it) and the Church of St. Joseph with its large tower, known as the symbol of Le Havre. It is actually quiet nice inside, although the outside looks like it was designed by the same architect as the Palace of Culture in Warsaw. The 15th-century cathedral also makes for an interesting visit, as it is one of the very few buildings to have survived the air raids. I also did an interesting harbour cruise and so spent an enjoyable day in this city, even though I still have some doubts about the WH value. You would think that a city made of concrete might be quite brutalistic or ugly - but Le Havre is absolutely stunning. There is something about the way the architects have taken the plain blocks and give them texture and colour that is quite unique and plays with your senses in a delightful way. The highlight of the visit is the cathedral and you must go inside to see the colourful displays you get when the sun shines through the windows. Many of the other public buildings and apartment blocks you can just enjoy from the outside while walking around. It is possible to go inside an apartment that has been maintained in the same style as it would have been when Le Havre was first developed like this after the war. Unfortunately I wasn't able to do this myself because of a mix up with my booking but I hear that it is well worth it! 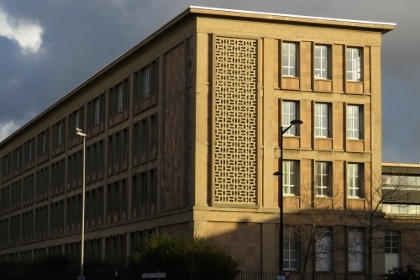 "Perret, la poétique du béton" (Perret, the poetics of concrete) was written on a poster at the Maison du Patrimoine in Le Havre. Well, that's certainly exaggerated and I can understand the visitors who find the city dull and uninteresting. But I liked to stroll through the streets and explore the city: the wide boulevards, the spacious squares, the straight lines and plain forms. The buildings appear monotonous at first glance, but at a closer look you can see the subtle details, the ornaments and the different shades of colour. 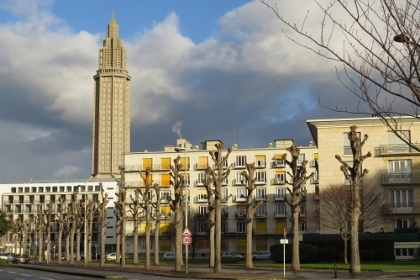 Le Havre was almost completely destroyed in WWII and Auguste Perret was commissioned to rebuild the city. Perret was known for his preference for concrete and he used the material for all buildings. It was novel and radical - and controversial - to rebuild a historic city according to a uniform plan entirely from concrete. The result was unusual for that time but definitely an improvement in the living conditions. Even today, the city appears light, airy and spacious. The city seems to be very proud of its World Heritage status, they were celebrating the 10th anniversary with an extensive program, many culural events and special guided tours. The Town Hall was decorated with banners with the UNESCO logo and looked exactly like on Ian's photo below from 2005, obviously they have kept the banners. The buildings opposite the Town Hall were the first project designed by Perret's studio. You can visit a reconstructed show flat in one of these blocks (tours are on Wednesdays, Saturdays and Sundays afternoon, starting point is the Maison du Patrimoine). We took the last tour at 5 pm, it was interesting though it was in French and I did not understand all the explanations. First, the guide talked about the history of the city, its reconstruction and Perret's ideas and principles. Then with about 25 other people, we visited the flat. It was quite spacious with windows at both sides of the building for maximal use of the natural light. The furnishing and electric devices were typical for the 1950s from today's perspective, but modern and comfortable compared to the pre-war period. 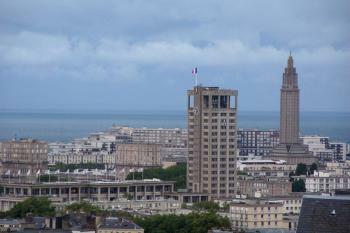 The tower of Saint Joseph is the landmark of Le Havre. The church is actually just a high octagonal tower on a square base. But it's worth to visit the interior: an open, almost unadorned hall with a central altar. The 'decoration' originates from thousands of small, coloured glass panes that produce atmospheric light effects. 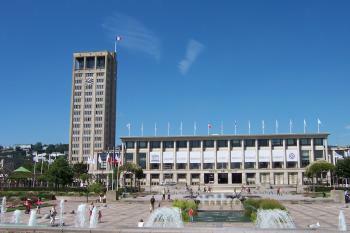 We spent a half day and a night in Le Havre, which is sufficient to visit the site properly. It was the first WHS on our trip through northern France and a nice start. Certainly, the sunny weather and the blue sky helped to enjoy our visit. Unfortunately, it was cloudy the next morning when I took the photo from the viewpoint at the Escalier Lechiblier. I visited this WHS in Summer 2011. The strange looking cathedral was the highlight of my visit but the modernist style of Auguste Perret could also be admired in the city centre. The name Le Havre, as used in modern times, simply translates as "the port" or "the harbour" and although a lot has been done to overcome the urban gloom and greyness of a city rebuilt after World War II, still there is nothing that would make me want to stay overnight. Practically one day here is enough to see it all. I've seen several examples of post-WWII rebuilds, most of them in Germany, like Kassel, Hannover, and Wupperthal. Cologne tops the list because of its size. These places all have something in common; they possess a chilling ambiance that mercilessly reminds one of the human will to annihilate. When I learned last summer that LeHavre had been selected for the World Heritage List, I was incredulous. This is because I cannot forget the day in July 1991 that I arrived there by train from Paris. I had a five-hour wait for the ferry to Portsmouth. Sad, grey, severe, and angular, and the materials looked shoddy. Now, I wasn't expecting a tourist venue oozing quaintness. But I wasn't prepared for this. The whole town seemed to weep. France, 1947. Devastated in two World Wars, politically adrift,losing its colonies,and broke. An elderly and respected architect is granted one of his last commissions, and the result, as least for me on that summer day, was an impression of crime, bewilderment, and profound grief. I'd seen the memorials at Verdun, but they offered little in the competition for Saddest Place in Europe. One recalls Patrick McGoohan as The Prisoner in his sinister village, or maybe a Jacques Tati remake done by George Romero, or a minimalist Rodenbach updating Bruges la morte. Maybe it's changed, but from the photos I've seen, I don't think so. Now that UNESCO has sanctified it, so to speak, I dream about visiting it again, out of respect for the folks who courageously face down LeHavre's smothering atmosphere of emptiness and loss. I dream about visiting again, but I don't believe I have the strength. The mayor is quoted as praising the city's "ambition and bravery" during the "exceptional" rebuild. Maybe. But on the Baleful Woe Scale, four stars. The first thing you can see when approaching from the sea is the tall tower of St Joesph church, this was one of the key projects that Perret designed himself, it is imposing if slightly phallic, but the inside is very impressive the tower has multi coloured glass and it gives the whole place an peculiar glow, making it very tranquil. The rest of the city is laid out on a grid and is all made of reinforced concrete, but there are subtle differences in the buildings. There are several plaza and gardens around the centre one of which contains the impressive cultural centre designed by Oscar Neiymeyer (architect of Brasilia). I visited just two weeks after Le Havre was added to the list and there were banners coving the Town hall and flags flying all around the main square which was very nice to see. You can climb the Tower of the Town Hall to get a good over view of the city's lay out. On the whole the site was nice but I didn't really feel that I was viewing something exceptional. As I live in Portsmouth, in southern England I have regularly visited many of the northern French ports that are linked by ferry. I had been through Le Havre several times before (even sleeping in the ferry port at the end of a trip across Europe) but I couldn't bring myself to count it as a visited site, as I only really passed through. So I decided to put my dissertation to one side and have a day trip there to increase WHS my tally. The good weather and novelty of being in a foreign country made it a worthwhile trip for me but I don't really think it is worth going out of your way for. As a WHS site I would say this is one of my least favourites. To get here you can travel up from Paris, it is just short of 3 hours by train if I remember correctly, or until mid 2005 at least you can get the ferry from Portsmouth. 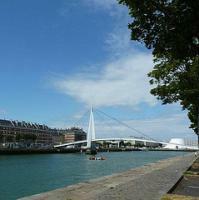 What is there to see and to do in Le Havre? 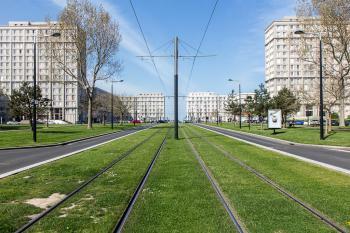 Modern Urban Planning: Criterion (iv): Le Havre is an outstanding post-war example of urban planning and architecture based on the unity of methodology and system of prefabrication, the systematic use of a modular grid and the innovative exploitation of the potential of concrete.